At the Closing Ceremony of the 10th edition, Tsitsi Dangarembga, founder and outgoing director, reflects on the first decade of the International Images Film Festival for Women (IIFF) passing the baton to Yvonne Jila. It's been ten intense years of struggle. Ten intense years of insisting that there is a place for women, women of colour, African women, Zimbabwean women, in this industry that is so often closed to us. Ten years of sometimes having to throw tantrums to drive the point out. It has also been ten amazing years of sisterhood. I did want to prepare a speech, well you saw me carrying around things, etc., so I didn’t have time to. So I am going to try to remember some of those amazing things that have enabled me to continue during this time, which has been a testing time I must say. I first came up with the idea of the film festival in 2001 when I came back from film school in Germany. And I looked at the landscape here and asked, 'what can I usefully do?' There was the Zimbabwe International Film Festival, which was running brilliantly and didn't need my interference, so I thought 'I couldn't do that'. It was not very easy to get money for production and I also realized that we needed a training platform. The idea of a woman's film festival came to mind because gender is really one of the components of film that we need to look into very closely to see how films are affecting our world, and affecting our behaviour, especially our behaviour in gendered relationships. So I pitched the idea to a couple of people very tentatively and I was waiting for people to tell me that I did not know what I was talking about, which is what people say to me when I come up with ideas. One of the people that I pitched the idea to was Jackie Cahi and Jackie never says to me, ‘Tsitsi you do not know what you are talking about’, in fact she said, ‘that is very interesting!’ And Jackie was one of the people who really accompanied me on the journey along with Doreen Sibanda, and Soukaina Edom who teaches the dance foundation course. Together we would sit in each other’s houses and drink tea and plot and plan. We did manage to start the festival in 2002. That year we had six films from Zimbabwe—one 35 mm film. And that festival in 2002 was made possible because of two women at the British Embassy at that time, Grace Mutandwa and Sophie Honey, and the Belgian ambassador at that time, Madame Fankinett. And there have been other women in diplomatic missions and organizations who have been able to lend a hand. This has been the case really since it began. We have had the former German ambassador to Zimbabwe, Karin Blumberger Sauerteig. There was Madame Baherle from the French Embassy, there was Kari Thorsen from the Norwegian Embassy, so it has been such a pleasure to see women supporting other women. Of course we have men supporting us. The French Embassy continues to support us. The Embassy of Iran has been a big supporter with wonderful films. And then there have been the men who have been supporting us. First and foremost my husband who sometimes did tell me that I did not know what I was talking about, but came on board nevertheless. We are moving more and more to engaging with men, as there are a whole bunch of young women who are very confident that they can handle the technical aspects, they are going all over the world telling people about what we have been doing. And so it has been absolutely wonderful. Then UNWOMEN (formerly UNIFEM) came on board to recognize another initiative, the Ndichirimupenyu Awards which honour women’s achievements, which was another idea that came out of IIFF. The idea of IIFF is also to be a celebration of womanhood, in the narrative, in life, and in other forms of art. We have also had poets to IIFF, we have had dancers, we have had musicians. Over the years it has been an amazing journey and I just want to say thank you to everybody. I want to say thank you to the WFOZ members, former WFOZ members, would you stand up, thank you. And those young women who have stayed with me in spite of the tantrums. It is not easy to run a festival like this for ten years; it really is an achievement. We are the first women’s film festival on the continent. There are some that have tried to take place and become professional. Most of them do not manage to become regular, but IIFF is the oldest; we have really tried to bear the torch for women’s filmmaking—here we have Angeline, a former chairperson of WFOZ, we have Florence who does wardrobe, we have Stella, an actress, some of you saw her in Nyami Nyami and the Evil Eggs, we have our own Charmaine, we have Porcia, and other members who could not make it today—all these young women have worked tirelessly. This year we worked for eight months without a single penny in our pockets. But we said, ‘we are going to make this happen’. I hope that people are not going to take the work of this film festival as the normal reproductive unpaid labour of women. I hope people are going to realize that our work does have a commercial value and to recognize that commercial value as the works of other festivals are also recognized. Thank you very much to everybody. And having said that I think the only thing I have to do is say goodbye. 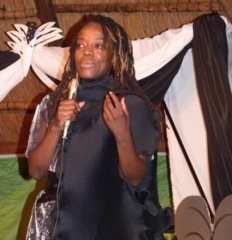 I am not leaving the Women Filmmakers of Zimbabwe, which is the parent organization to IIFF, I am staying on as CEO because I do believe that mentoring is important especially when one hands over the baton and I will try to develop some of the other programs of the Women Filmmakers of Zimbabwe. I have also recently created a trust of the Institute of Creative Arts for Progress in Africa, our board member, Charles Chirikure is here. I want to get more involved in the structural issues surrounding the arts in this country because I have seen that the individual efforts of small organizations like this cannot really have the impact that we want. We have created a space but that space needs to be made more effective and so I am addressing some of the structural issues around art. Thank you everyone for your support. The Cultural Fund, Zimbabwe-German Society, the Swiss Embassy, British Council, the Embassy of Japan with those wonderful films, from the French Embassy, to all those people who have contributed. As Yvonne Jila comes over to tell you her vision of IIFF, as IIFF goes forward, I would like you to know that I appreciate everyone of you and this has been a meaningful time in my life, thank you.